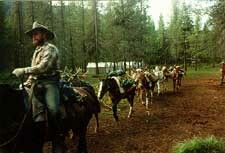 Our Idaho summer fishing/pack trips are 4-10 day trips into our Kelly Creek camp. 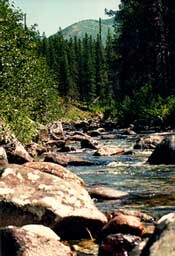 Kelly Creek is a remote fast moving stream in northern Idaho and is one of Idaho's premier blue ribbon trout streams, holding wild native cutthroat in the 10-16 inch class, with a rare fish over 20 inches. It also holds some smaller rainbows and an occasional brown. It is perfect dry fly water. Depending on your wants we may also fish some of the high mountain lakes in the area, go sightseeing or wildlife viewing and horseback riding. On our 4-10 day Montana fishing/pack trips you can stay near high mountain lakes in the state line area, where we can ride down into high mountain valleys and view the spectacular mountain scenery for as far as the eye can see. On either trip be sure to bring a camera and lots of film, as we may view lots of wildlife in undisturbed settings. We will be glad to work with you to put together a quality trip. For more detailed information, references or booking information on our Fishing or Pack trips contact us at.